Fair Trade bags, hand decorated in France with their patterns. 36,5 cm x 40 cm. 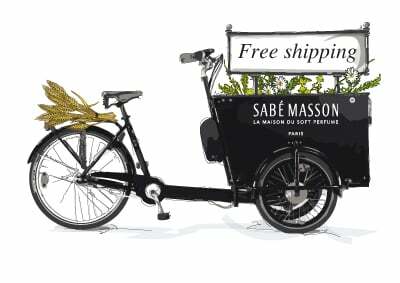 We take all of our essentials with us in this first Sabé Masson Tote Bag. Featuring the " Eu Vent de Vous" ' olfactory macaroon, you’re going to discover noble raw materials, of all of our fragrances. The first of 19 to come ! "Everyone who works has the right to just and favourable remuneration ensuring himself and his family an existence worthy of human dignity." Universal Declaration of Human Rights, 1948, Article 23, paragraph 3.